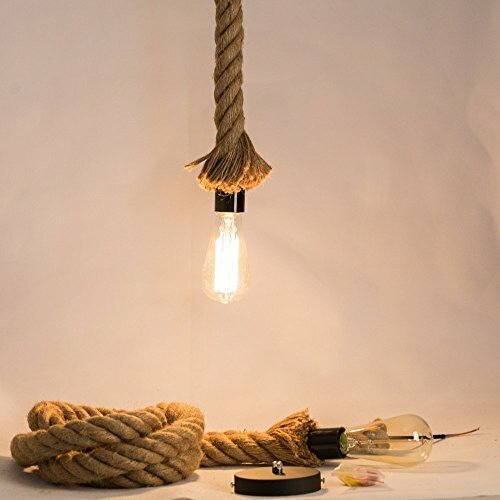 Simplicity edison industrial pendant light,made from sailing rope, nautical lamp, nautical rope, perfect for beach house and nautical styl apartments. Basic series incorporates a handcraft and original style with rough jute rope. All cords are woven into the rope. Our Jute Basic pendant lights don't have lampshades. Notices : WE SUGGEST INSTALLATION BY A LICENSED ELECTRICIAN .This fixture has been rated for up to 40-watt maximum Type A bulb (Not Included 40W Edison Bulbs). To reduce the risk of fire, electrical shock, or personal injury, always turn off and unplug fixture and allow it to cool prior to replacing light bulb. Do not touch bulb when fixture is turned on or look directly at lit bulb. Keep flammable materials away from lit bulb. Jorunhe is the original manufacturers, we ensure quality.Please confirm if this is our Jorunhe products and do not buy the counterfeit from others.The counterfeit is not protected by us.The product is backed up by our 30-day Money-back Guarantee, it's a risk-free purchase. Number of lights : 1 (Not included bulbs) / Base: E27. This kit has everything you need to install. If you need any help,please contacts us,we will try our best to solve your problem.Thanks for your chose us. Approx100 cm（39 In） height.Simple structure, morden style, best for your house decoration. If you have any questions about this product by Jorunhe, contact us by completing and submitting the form below. If you are looking for a specif part number, please include it with your message.